Ethel and Julius Rosenberg get the death penalty for a crime that no one seems sure they committed. 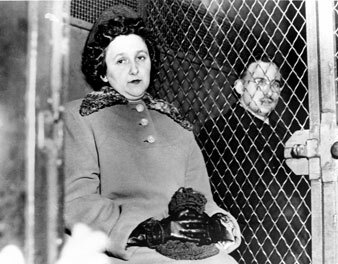 Everett Collection Ethel Rosenberg and her husband Julius Rosenberg. In view of all this, why the fuss about the Rosenbergs? The answer lies in the penalty, the sentence of death. Julius and Ethel Rosenberg are lodged in Sing Sing awaiting execution. As the trial court said, it is hard to conceive of a crime which, as events have transpired, could have more vicious consequences. Yet we cannot forget that Klaus Fuchs, the scientist and chief conspirator in this whole business, was tried in England and sentenced to only fourteen years in jail, and that in the Canadian spy trials the sentences were relatively light. We may try, but we cannot forget the two young Rosenberg children. In support of that contention [that the penalty should be reduced] they assert the following: That they did not act from venal or pecuniary motives; except for this conviction, their records as citizens and parents are unblemished; at the most, out of idealistic motives they gave secret information to Soviet Russia when it was our war-time ally; for this breach they are sentenced to die, while those who, according to the government, were their confederates, at least equally implicated in wartime espionage — Harry Gold, Klaus Fuchs, Elizabeth Bentley, and the Greenglasses — get off with far lighter sentences or go free altogether. Finally, they argue, the death sentence is unprecedented. In a case like this: No civil court has ever imposed this penalty in an espionage case, and it has been imposed by such a court in two treason cases only. It is the damnable death penalty that causes the uneasiness. To avoid this horrible killing by the state, argument is made that the trial was unfair, and some people, mostly leftists I take it, are claiming that the Rosenbergs are innocent. If this judgment is carried through, we shall make martyrs of the Rosenbergs, perhaps not too many people in the United States, but to millions in other parts of the world. You can imagine what would be our own emotional response if two Russians were sentenced to death for supplying information to us while we were allied with Russia. Somehow, I cannot help feeling that the British treatment of Fuchs shows a higher degree of civilization than the sentence in this case. Dear Sirs: After the French Dreyfus Case was legally considered closed the court of public opinion busted it wide open. The Rosenberg case, considered closed by many people today, can be busted wide open as soon as important facts “freely” withheld by our “free” press manage to get loose. This letter will touch on only two of those facts. Another fact, which has received no publicity whatever, is that, whereas scientists, as far back as 1945, stated that there was no A-bomb secret for us to keep since the scientists of all countries knew it, the lawyers defending the Rosenbergs seem to have operated on the misconception that there was a secret. The trial transcript (pp. 499-500) shows that when the prosecutor introduced a diagram drawn from memory by David Greenglass, allegedly a reproduction of an A-bomb sketch which Greenglass claimed he had given to Rosenberg in 1945, the defense attorney requested that the court seal the sketch “so that it remains secret to the court, the jury, and counsel.” The diagram, duly sealed, became inaccessible to scientists who might easily have exposed it as a brainstorm or fraud. That sealed sketch in the Rosenberg case bears a striking resemblance to the infamous bordereau in the Dreyfus Case, sealed legally by the French military court on the grounds of French national security and unsealed by an aroused public opinion. In this same connection, the transcript further shows (pp. 500-501) that when the prosecutor asked Greenglass to explain his diagram, the Rosenberg defense came forth with the request that the courtroom be cleared of spectators while Greenglass was describing it. This explanation, Time said, “made little sense,” and the science editor of Life thought his description of an implosion bomb “illogical, if not downright unworkable.” But the dramatic clearing of the courtroom and the solemn sealing of an open “secret,” both done at the inspiration of the defense attorneys, could not have failed to impress the jury, confuse the public, and lend a semblance of moral validity to the unprecedented death sentence handed down. If, as seems to this layman, this was a serious error in judgment on the part of the defense attorneys, they could at this point best serve the interests of their hard-pressed clients by entering a motion for a new trial. Such a move, even if it carried no weight with legalistic-minded judges, is bound to carry plenty of weight with the court of public opinion before which the Rosenberg’s case must now be actively prosecuted. Amid this spreading bigotry and confusion, The Nation, which hospitably accepted the ad, shines like a beacon of genuine liberalism. The Nation, which several times has raised its voice in behalf of clemency for the Rosenbergs, again urged it in a telegram to the President early this week. As these lines are written, their final hour is drawing near. What useful purpose do their deaths serve? If they have been spies, do we fear — if we let them live — that they will continue to spy from their prison cells? Does anyone think that their deaths will deter espionage agents anywhere who habitually live with death? If the British permitted Fuchs to live — the scientist who had infinitely greater capacity for espionage than ever the Rosenbergs displayed — what is it that impels us to the utmost savage reprisal? We can only hope that through some last-minute reprieve, the Rosenbergs will still be alive when these lines are read. It is indeed an astonishing thing that the most important issue of this whole astonishing case appears only to have been raised in the last minute of the eleventh hour…Only on Wednesday of this week, President Eisenhower was saying how the Coronation had thrown a vivid light on the glorious heritage of law that was common to the United States and Britain. It is a pity that a heritage of clemency is not apparently common to them. This failure of the American conscience was, however, in part redeemed by the courage, insight, and moral integrity of Justice Douglas and Justice Black. Every American who values our tradition of individual as distinguished from “political” or collective justice will be forever grateful to them. The failure was also redeemed in part by the Rosenbergs who, guilty or not, went to their deaths with a composure and dignity that won praise even from hostile newspapers. B ut this publication feels a special gratitude to Irwin Edelman, an indefatigable pamphleteer and soapbox orator who has been attempting to enlighten the crowds in Los Angeles’ Pershing Square these many years. Expelled from the Communist Party in 1947, Edelman did not turn informer or renegade; instead he turned on the fools and opportunists who had expelled him and has been making life miserable for them ever since. Advertisements for his first pamphlet on the Rosenberg case — thoroughly justified criticism of the manner in which the defense had been conducted — were refused by, among other publications, the National Guardian. The ads appeared in The Nation as did a lengthy communication from Edelman. In the last tragic chapter it was Edelman who came forward as the “friend” of the Rosenbergs to raise the point, over the objection of the Rosenbergs’ accredited counsel, that won a stay and might, if it had been raised earlier, have won a review. Yet one of the justices referred to him as a “vagrant,” citing a court decision from which it clearly appears that Edelman had raised and carried to the Supreme Court of California an important free-speech issue. A word of appreciation, too, should go to Daniel G. Marshall and Fyke Farmer, the lawyers who volunteered to help Edelman and who, with him, were denounced as “intruders and interlopers.” A prominent Catholic layman whose trip to Washington was financed by Los Angeles Unitarians, Mr. Marshall has a fine record of distinguished service on behalf of civil rights and liberties. On the night the Rosenbergs were executed, the intrepid Edelman was chased from Pershing Square by an angry crowd. As the spry little Russian-born pamphleteer sought refuge in a nearby coffee shop, he shouted at his pursuers: “If you are happy about the execution of the Rosenbergs, you are rotten to the core.” In that act of defiance and clarity, this little man with a passion for justice demonstrated, as Chapman demonstrated in 1911, that there are always some Americans who can not remain aloof when they look on the agony of a fellow human.